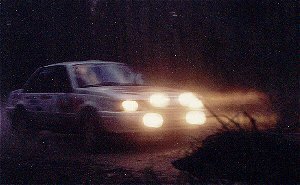 Night stage with Tony Best navigating in Queensland GP Cars Clubman Series 1996, by mid year I was =2nd in the championship. At the Cooloola Classic Rally I was starter 39, because I was from NSW(a different system). With Barrie Burr navigating we had a good rally finishing 4th, that jumped me up to 25th seed in the state. 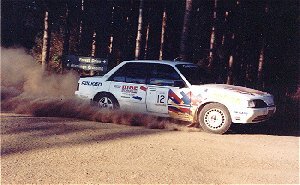 Last event in the Camira September 1996, a DNF with a blown engine. In fact I split the block in two, the head was the only thing left untouched. I was not impressed, I had mixed luck that year but was still in contention for the Queensland State Class Title. There was fault with warn rocker arms, but the problem was a couple of twisted con rods I was supplied, one which was in this motor. I'm sure every one has a similar story about trusting that people know what they are doing.